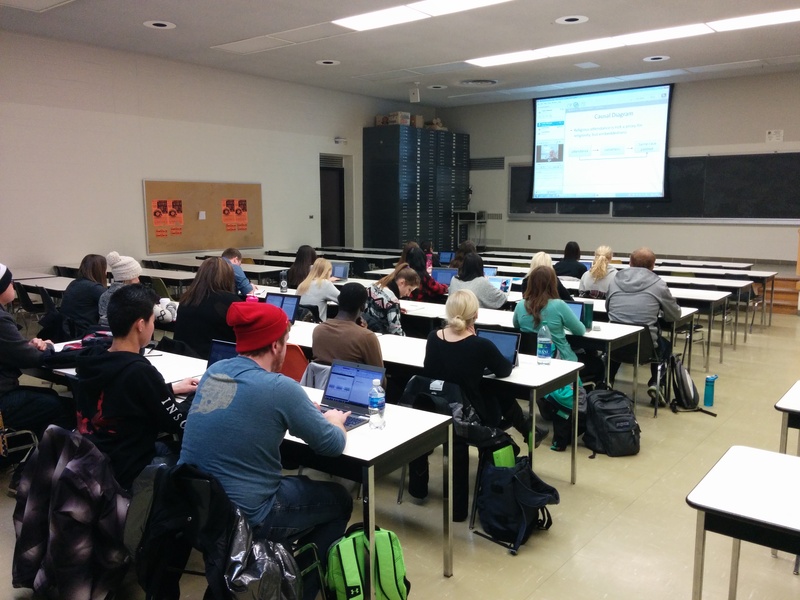 On Friday February 6, 2015, the undergraduate students from Sam Reimer’s course in advanced research methods at Crandall University linked via webinar with the undergraduate students from Cathy Holtmann’s course in methods of social research at the University of Saskatchewan. 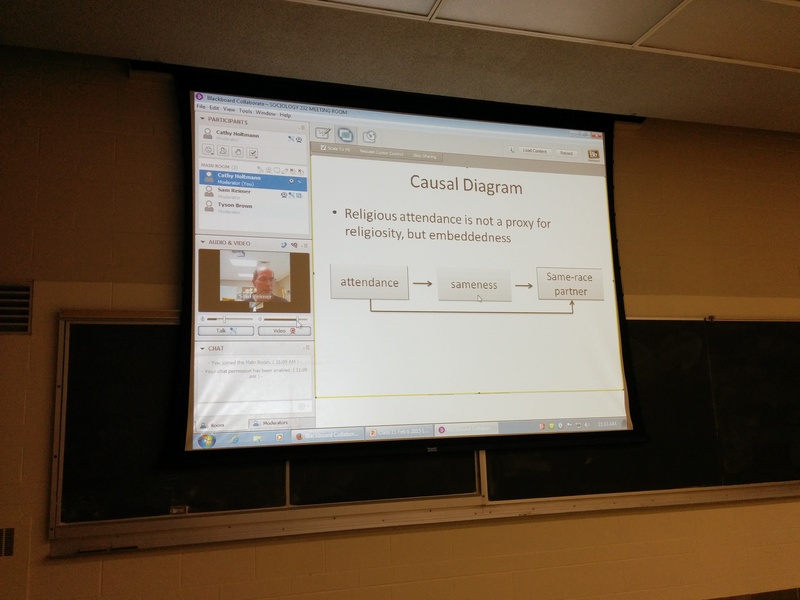 The purpose of the hour-long exercise was to inform our undergraduate students about recent research in the sociology of religion, provide an opportunity for them to deepen their learning about research methods based on two different research projects, and to use existing technology to interact with a professor and students in a similar course from another part of the country. Perry, S. 2014. "More like us: How religious service attendance hinders interracial romance." Sociology of Religion 75(3): 442-462. Kraus, R. 2014. "Transforming spirituality in artistic leisure: How the spiritual meaning of belly dance changes over time." Journal for the Scientific Study of Religion 53(3): 459-478. The students were also provided with a list of questions to guide their reading of the article. We used Blackboard Collaborate, the webinar software supported by the University of Saskatchewan and were grateful to have had assistance from Tyson Brown who works with ICT as well as from Srijita Sarkar, a doctoral student in the Sociology Department. 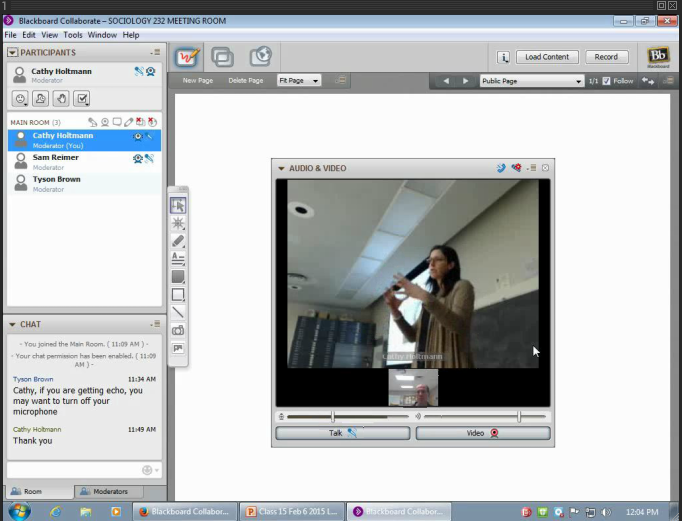 In each classroom, one computer equipped with a web camera and microphone was linked to a projector so that the webinar images were projected onto a large screen. 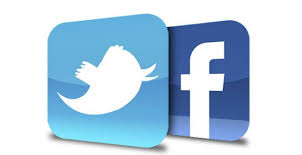 Once logged on to Collaborate, people from both classrooms were able to see, hear and speak to one another. 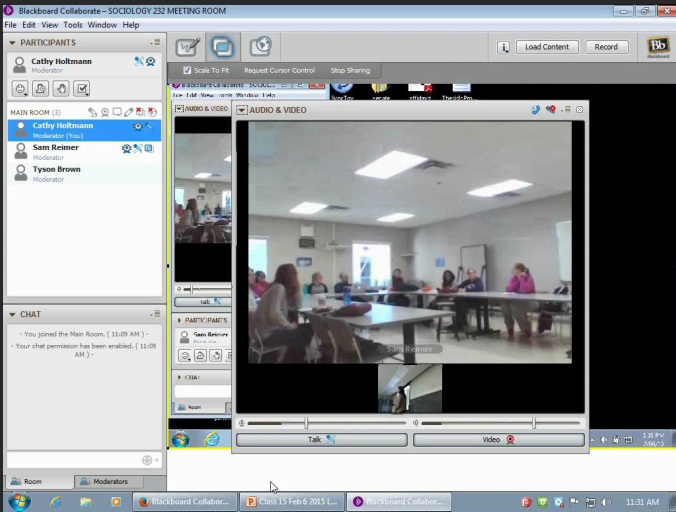 Sam began by introducing his students (N=12) in Moncton to the class in Saskatoon. Using PowerPoint slides, Sam explained the results of the regression models that Perry had used. Using data from the 2007 Baylor Religion Survey, the research showed that interracial romance is hindered by the moderating variable of endogamy, or embeddedness in a socio-religious community, rather than by regular religious attendance directly. The students from the University of Saskatchewan asked Sam questions about the impact of religious similarities and differences within couples. 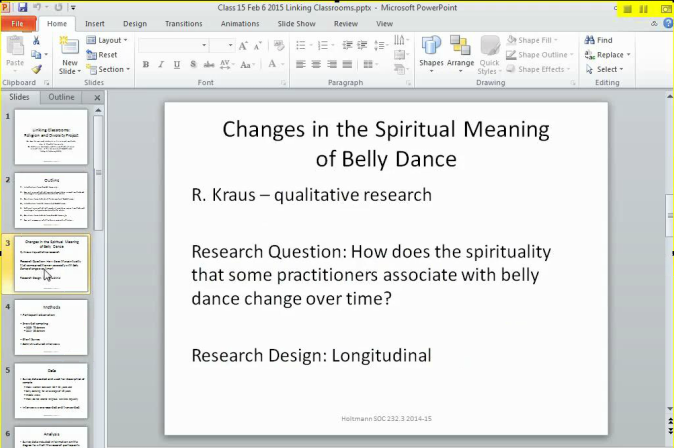 Then it was Cathy' turn to introduce her students (N=25) and lead the group through the qualitative methods used by Kraus in her longitudinal study of spiritual change among belly dancers. Students from Crandall were interested in hearing more about the study of spiritual change and the differences in spirituality between 'dwellers' and 'seekers'. Sam wrapped up the class by reviewing what had taken place and inviting the students to check out the Religion and Diversity Project website for more information on religious diversity.